I had planned to make up a Christmas eCard out of the map of Christmas Island, but having looked at it and discovering it didn't look very christmassy, I decided against it. I hope you have a great festive season, as I will be having whilst at home on the Isle of Man. The free-to-use maps that volunteers in the OpenStreetMap project have been building over the past year or two have been given a new look. Thanks to the Mapnik project, the new maps look much more like Google Maps et al. and are actually available through the 'slippy map' interface on the OpenStreetMap website instead of having to download the data and generate them locally as had been true until recently (e.g. see the map of Stuttgart I generated recently). There are a lot of tiles to generate, and it may take some time to generate tiles for the whole world. The focus therefore had initially been on getting England covered, but is now expanding to cover other areas. Nick Black stepped in to render the Isle of Man, where these examples are from. These maps are all available under the Creative Commons Attribution-ShareAlike 2.0 license. I spent much of my evening today scanning in the 1940 Second War Revision map of the Isle of Man. Now that it's all scanned I took the opportunity to have a closer look around some of the places I'm familiar with back on the Island, as well as some things from the past which I'm not so familiar with. Much has stayed the same on the Island since this map was made at the start of the Second World War, though there have also been some big changes. Towns have grown in size, bypasses have been built to take increasing traffic out of old centres, train lines that used to run from Douglas through St Johns to Peel and Ramsey have been dismantled, and the airport extended from its wartime status as an aerodrome into something a little bigger. Before I started looking into the grid system used on this map this evening, I hadn't realised that the maps produced during the war weren't yet using the British National Grid for referencing, and instead were using a military grid that also consisted of 1km grid squares - just not the same ones as the National Grid. 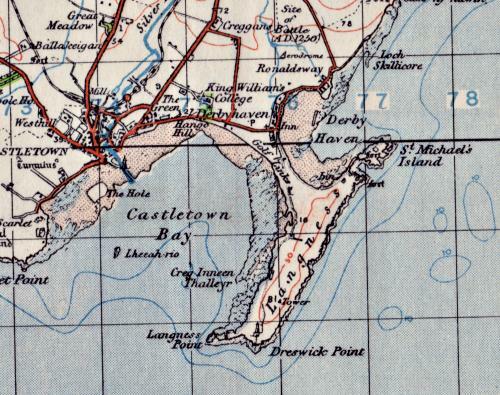 A couple of weeks ago I started looking around on eBay for old maps of the Isle of Man, partly because they may be of some use to the OpenStreetMap project, and partly because it would be really interesting to see what had changed in the past fifty or hundred years around the Island. The thing that triggered me to go out and find them was the launch of Richard Fairhurst's online browser of the 1930s and 40s Ordnance Survey New Public Edition map of England and Wales. He'd spent quite some time collecting the maps from secondhand shops knowing that 50 years after their publication the copyright on them expired and hence they get released into the Public Domain where anybody can do with the data what they wish. He worked with a couple of other people to scan all of the maps and build a site that lets people browse them and start to build up a copyright-free database of postcodes. It lowers the barriers for people willing to share the locations of their postcodes, and makes it much easier (though less accurate) than the Free The Postcode method of getting people with GPS units to submit precise coordinates for postcodes they know. But back to the maps of the Island. The one map I was most interested in was the Second War Revision (Sheet 17) published by the Ordnance Survey in 1940. It covers the Isle of Man at a similar scale as the modern Sheet 95 of the Landranger series, but is now in the public domain, having been published 66 years ago under Crown Copyright. It will be a great reference point for extracting data for OpenStreetMap, showing the paths of rivers and roads between towns and villages on the Island. It doesn't really give enough detail to be useful within the towns themselves. I also found some old street plans of Douglas, Onchan, Ramsey, Port Erin, Port St Mary and Castletown dating back to the late 40s (the Peel plan appears to state Nov 47). They can't be used for anything other than personal interest, as far as I'm aware, because they weren't published under Crown Copyright and the copyright instead falls either under the local authorities of those places, with the cartographers, or with the publisher. All of which mean that the maps won't fall out of copyright until at least 70 years after they were published, or 2017. Or at least, that's as I understand it. The 1963 Ordnance Survey map (Sheet 87) I also found would have fallen out of copyright a little before that, in 2013, but in reality it probably doesn't give much more information than the 1940 version, and the Island will have long been mapped in OpenStreetMap by that point. 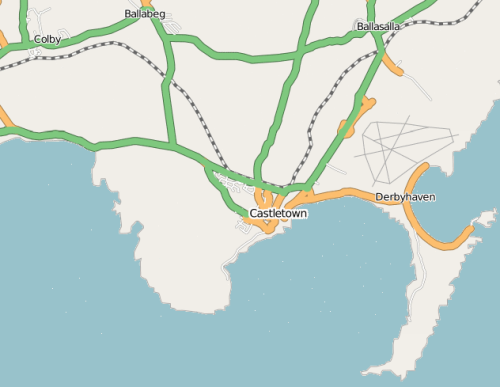 Talking of mapping the Isle of Man, I am planning to do some more mapping of Castletown and Douglas for OpenStreetMap between Christmas and New Year. If anybody is interested in helping out or finding out more, just get in touch. I have a spare GPS unit that can be used as well. For quite some time now I've been thinking about the best way to create a mapping and local information site for the Isle of Man - what will become Mapping.im once ready. Currently it's a very bare, ugly site, so don't pay too much attention to it. Working with the Drupal content management system so much, I naturally thought of that as the way forward, largely because of its flexibility but also because it gives me a good head start in developing a site that can do all sorts of things already, without me having to implement them individually. I had jotted down some notes in the past about what I wanted out of a site, but never really got quite as far as implementation details. Then earlier this week I went to an old haunt of mine - an Irish bar by where I lived in the first few months of being here in Stuttgart - and sat down with my notepad and pen (both of which I carry at all times). I wanted to start jotting down some more fine grained requirements for what I want, and how I may go about integrating this into Drupal as a module that other people can apply for their own local areas as well. Then last night I started coding the OpenStreetMap module up. 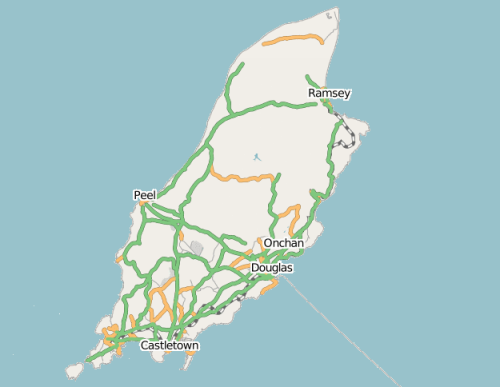 I'm hoping - as long as I can spend enough time on the project - that I will soon have the ability to create a local information site for the Isle of Man, based on top of a map from the OpenStreetMap project to which I've already contributed a large amount of data for the island to get the mapping process started. (Since I started earlier this year a number of other people have joined in to flesh out that data even more, which is handy because being in Germany right now, I can't add too much). I would have spent the weekend working on the module but I'm actually travelling over to Munich in the morning to meet up with a bunch of OpenStreetMappers for a Mapping Weekend to map the centre of Munich. I found out today a little more information about the .im domain situation I was talking about. I heard back from the guy selling the peel.im domain about the price he was asking for, and also heard back from the registrars about their policy on reserving names relating to some places but not other. If you're interested in buying the domain for Peel, Isle of Man - peel.im - then you are looking at paying around $1000 (he's "willing to let this one go pretty cheaply"). That's only about 11 times the price it was purchased for. It does seem a shame to have this domain taken away from the people of Peel, and it's a shame that it was allowed to happen, but perhaps he's not broken any of the rules. It's not for me to say what's right or not about the registering of that domain, but I would like to help prevent it happening to other domains that relate to place names on the Isle of Man. The registry inform me that the place name domains that appeared to have been reserved have not been reserved because they are placenames, but because they have been offered to the owners of the third level domains (e.g. castletown.im reserved for the owners of castletown.org.im) who have until the end of September to claim their domain (costing only £5 initially). After that date, if the second level domains haven't been taken on by the owners of the corresponding third level domain then the domains will be released to the public. With no policy in place to hold back the names of towns and villages that hadn't previously been registered, I think it's important that something be done to protect them. Perhaps there should be more publicity on the Island (not being there at the moment, I don't know what publicity there has been already) to convince local authorities that they should invest in their name on the internet. Perhaps for some places, names should be reserved by Isle of Man Tourism or by Manx National Heritage. If these organisations don't pick up on their relevant domains, perhaps there should be a sort of Open Domain project to help protect those domains? I'd donate a domain to that sort of project if others were to do it too. I discovered today that the .im domain registry has been opened up to be more freely available, allowing anyone with an interest to buy a .im domain. The registry has been opened up to be more like the .tv domain which appealed especially to TV companies. The maintainers of the Isle of Man's domain hope that .im will to appeal to Internet Messaging companies. Previously the domains were only available to Isle of Man based organisations who could prove they had a right to the name; the process was manual, and the domain had to be approved by a committee before it could be created. Now, the process has been automated, has a pretty website, and is available to anyone, whether based on the Island or not. The domains are still checked up-front against a list of 'inappropriate domains' and apparently vetted by a committee (after the automated registration process). I thought it was a little weird because previously you could only register third level domains (eg yourname.co.im). Wanting to know more, I went to the nic.im website to check it out, seeing that peel.im is in fact registered and being put up for sale by someone in San Francisco. It seems a shame to me that people can hold 'local domains' for a ransom. In my opinion, [placename].im domains should be reserved for use by local organisations for a relevant local website, be that perhaps a local government website (though the move of Douglas Borough Council from douglas.org.im to douglas.gov.im instead of douglas.im suggests that maybe needn't be the case) or at least a website that's related to that location. Checking some of the other domains, like ballasalla.im, castletown.im, douglas.im, laxey.im, they do appear to have been reserved by the registry, but there were a number which I tried which haven't been reserved and still run the risk of having some opportunist buying them and holding them for ransom. Perhaps the rest of the [placename].im domains should be placed on the reserved list to prevent this from happening, though I'm not sure how you'd choose the rightful owner of these domains if they weren't all reserved for government use, for example. On a related note, it's interesting that my design for geodan.org appears to have been inspired by the 1997 version of the nic.im website. This wasn't intentional, though there must have been some subconscious link reminding me of this website design from almost 10 years ago. How retro. Whilst home in the Isle of Man at the end of August I visited my great uncle. He's approaching 100 and is one of the few local people still left in the village of Cregneash, much of which is now operating as a living museum. He's also a bit of a film star, having had a few small roles in locally produced movies - Waking Ned perhaps being the most famous. Being so well known he gets a lot of visitors, and this time was no exception. When I popped by, he had a student visiting asking questions about Cregneash for a university project, and also a teacher from the only Manx language primary school on the Island. The school, Bunscoill Gaelgagh in St John's, uses the medium of Manx for teaching primary school children. The majority of classes are tought in Manx, with only about 10% being taught in English. They also get to learn French as a third language. Having learnt a little Manx when I was younger, and being keen to refresh my memory of it when starting university back in 2000, I wanted to find out how the first generation of native Manx speakers in a long time are getting to grips with the language. (I still haven't gone back and refreshed my knowledge of it, though I'd still love to, if I can find a good Manx distance learning course to take). I had my doubts about how successful the Manx-medium school would be when I first heard about it. It turns out, however, that the children are doing very well, being fluent Manx speakers, fluent English speakers and are picking up French very easily as well. It'll be interesting to see what happens in years to come, how many people will be speaking Manx again, how often it will be used, and what it will be used for. As you can imagine, re-introducing a language almost from scratch will be a difficult, and probably quite long process. Being a descendant of one of the last native Manx speakers, I look forward to the day when I will hear people speaking Manx to one another in everyday life. Hopefully by then I will have actually learnt some, and will be able to join in. With today being Tynwald Day, the national day of the Isle of Man, and yesterday being Independence Day for Americans, it seems as good a time as any to write about what I've seen in Germany recently in relation to a massively boosted sense of national pride. Or at least visible national pride. When I first arrived to live in Germany I didn't really notice it. But after a while, and after travelling to a few other places, I noticed a distinct lack of something here in Germany. Flags. Wherever I went there were very few black, red and gold German flags. It was only every now and then that it struck me how few and far between they seemed to be. Then, in the run up to the World Cup here in Stuttgart, flags started to appear much more regularly. I think it's only natural that football would bring out people's desires to show their support for their team, especially when there are so many other countries coming to visit, each of whom will be doing exactly the same. But it's very strange to suddenly see so many flags, when previously there had been so few. The sight of so many German flags around has been quite an impressive sight - and actually quite moving. It's not until you talk to local people about the distinct lack of flags - and sudden influx - that you start to realise how difficult it is for some to feel comfortable identifying with such a sense of national pride. The flag, and national pride, still seems to worry some people a little. Often where flags are flown, or identities associated with, they are of the region and not of the country as a whole. As an outsider, or Auslander as we're known here, it's great to see that national pride, and from people I've spoken to, it gives them perhaps that little boost to know that outsiders see German people's national pride as a really positive thing. This situation could well be different dependent on where in the country you are, and who you speak to, but it's something I've found fascinating, especially since the onset of the World Cup. It'll be interesting to see what happens with all the flags after the game has finished. I for one hope they keep flying high everywhere you look. The Isle of Man got another mention at a conference today (this time it was Where 2.0, last time, a presentation at reboot 8) relating to the mapping work that a number of us from/on the Isle of Man have been working on for the OpenStreetMap project. The OpenStreetMap project actually has a broad coverage of the island, admittedly with large chunks still missing, but it's a great start. Compare that with Google who seem to have decided against buying the Manx road network for their Google Maps site, despite their coverage of most of the rest of Europe. Ask maps on the other hand do have data for the Isle of Man, as well as some great high resolution imagery of the towns. For businesses, organisations and individuals, buying data from the likes of Navteq and Ordnance Survey would allow some use of maps, though they would be heavily restricted with what they could do with them. Whilst they are pretty much guaranteed to be of a certain standard, they must pay a high price for that privelage: one which is not easily afforded by small businesses, organisations and individuals who just want to be creative with maps. Building up our own open source dataset means that people will be able to use road information for many different purposes, with credit to the project, and hopefully at the same time give a little input back into the project as well. Much of the work I've been doing with regard to the project of late has not been actual mapping - it's difficult when such a long way from the place - but instead research into meta data for the tracks that I've already created on the island. It turns out that the Isle of Man Government site is a treasure trove of information about road closures, which proves a great source for road numbers and names as well as starting and end points. 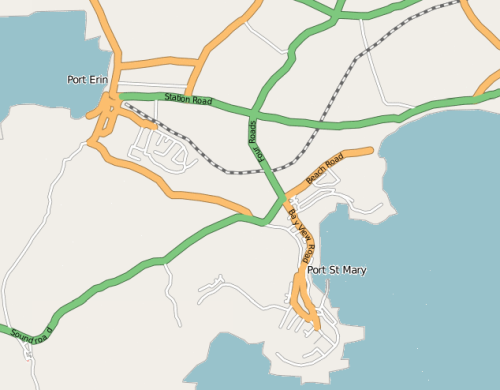 Add in a dash of local knowledge and I can begin to build up a database of roads on the Isle of Man with which I can tag the streets I previously had no metadata recorded for.